I have several jumper-dresses, which I mostly live in through the winter – a single item of clothing that takes seconds to put on. Combined with leggings for after swimming they are chosen for maximum covering-power in minimum time and loose enough to use as a changing-tent to remove a cossie from beneath. Until you try it. Cold, uncoordinated, wet, with hands with no strength in them, and no longer sure of the exact finger count of these bright pink appendages, which are certainly not my usual hands. In a stiff wind while balanced on a sodden towel against the freezing concrete. “Oh, a jumper dress, that’s a good idea!” say two people while I am struggling with this thing that was once clothing, transformed into an enveloping monster from a chilly circle of Hell. “Bloody isn’t”, I think. And then suddenly the Herculean task is done. Unusually, I glance at my watch, and discovered that despite being able to swear that the battle had taken 10 whole minutes, it is in fact a mere 2 minutes since I exited from the water. Odd that, time is a slippery thing when you’re running from the inevitable afterdrop. Come on shivering, ready for you now! 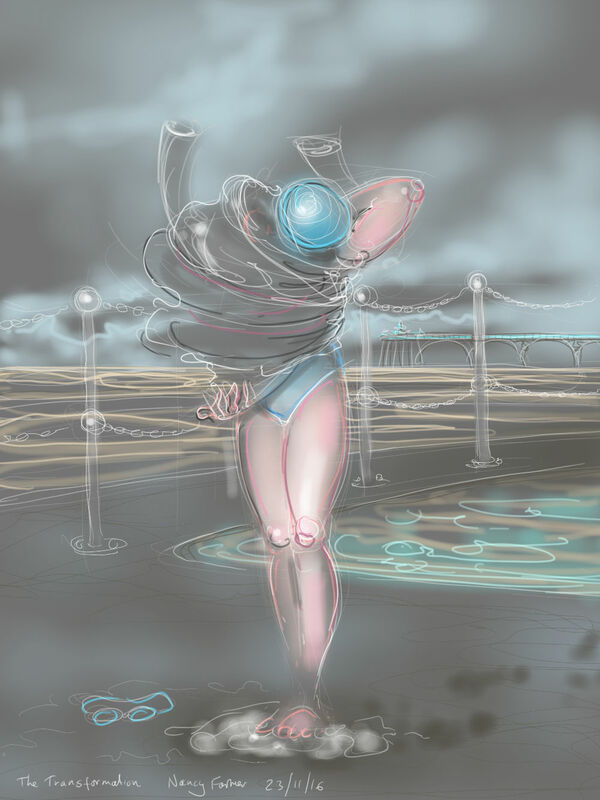 This entry was posted in showcase, swimming and tagged afterdrop, art, Clevedon Marine Lake, cold water swimming, drawing, ice swimming, swimming, swimming drawings on November 24, 2016 by Nancy Farmer.